“I had been a member of Fine Gael for six years, and was elected to the party’s youth executive alongside Leo Varadkar and Lucinda Creighton. My role was organiser with the youth wing meant I had canvassed in 25 constituencies with three different Fine Gael leaders. I was on the Youth of the European People’s Party conference circuit with Leo and Lucinda. My involvement was obsessive. The initial motivation to join was probably influenced by my grand-uncle, a member of the Michael Collins’ 12 apostles. There was a trajectory: I was 25 and needed to make a decision between politics or a professional career. Elaine Byrne’s article reflecting on her dark past in yesterday’s Sunday Business Post (behind paywall here). 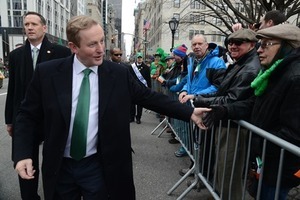 Posted in Misc and tagged Elaine Byrne, Enda Kenny, Sunday Business Post at 1:40 pm on September 29, 2014 by Broadsheet. What I’m getting from this is she was an obsessive young party activist who only left because she felt the leader was sexist. Not because the very concept of civil war politics and cronyism, which she no doubt was courting in being an obsessive young party activist, is entirely broken. Or that she chose to do something that is, at least on its face, likely to give her some experience of something, rather than becoming a politician for life, with no experience of anything productive. So sexism put her off being a terminally useless political lick arse with the same senseless irrational loyalty of a barstool football fan. Wont be reading her articles again. Hmmm. Well, that’s not how Lucinda turned out. Er. You say that as it it’s a bad thing? Given Elaine’s decidedly odd personality and lack of any common touch – I knew her for a few years – I’m not sure she would be suited to politics anyway. What exactly is ‘lack of any common touch’. Can you give us an example? …I get the distinct feeling that while Elaine may have given up on FG, she hasn’t given up on politics. Is it corruption to be in the company of rich people (especially when you have no political power)? what’s the problem, that he has a few drinking buddies from work? wow, guess i better not play cards with any of the lads anymore lest I am deemed sexist. Pretty much. Guys do that all the time – assume girls don’t want to go mountain biking, paintballing, poker playing… etc. Why not ask? The point here was that they formed a committee of “the guys”. Wouldn’t you be furious if plans for your work were being made behind closed doors? We formed a club at the nail bar. Oh you weren’t there. We forgot! “We met in a pub in Tipperary and it became intense as the night wore on”. Drink’ll do that all right. She seems to be more concerned with the thought that she might be outside of the groups of cronies within the party than she is with the fact that cronyism exists in the first place. She reminds me of Bender on Futurama..
Ah political parties, those organisations which appeal to the lowest common denominator both inside and outside ‘the tent’. Member of YFG because he family were FG members? Isn’t this Byrne character supposed to be a voice for change? What was she going to do? 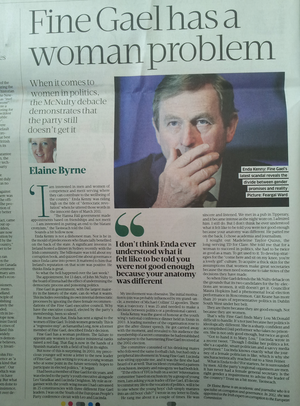 Build up a career within FG, and then, when she got to the top, throw it all away for her principles? It reads as though she would have been happy had she been on the inside looking out. This snippet, which I assume is reflective of the rest of the article, has damaged her credibility as a voice of reason/change. Men need to “let their hair down” once in a while too. Let us. Most women never leave the house without being done up, if you didn’t have a home to go to where you could just be yourself you’d probably go insane. Men can’t be themselves in front of women There’s nothing worse than trying to organise a “just the lads” night and some guy bringing his girlfriend along. Now we all have to watch what we say. Women need to stop trying to join the boys club and just form their own clubs. If you want to go get pissed and talk about politics start your own club. If you can’t organise a piss-up you clearly lack the natural authority to make it in politics anyway. You’re not being “excluded” any more than the 6 billion other people who weren’t there were being excluded. It’s important to note that Lucinda stayed in the party and was successful until she ended her relationship with FG on HER terms. Sexism didn’t hinder her.